Sevilla only has two weeks between Semana Santa and the Feria de Abril (but this year it will take place in May!) Sevilliansare getting ready for a week full of rebujito, jamón, sevillanas and horses. Forget your watch, time doesn´t exist anymore this week. The Feria starts on Monday night with “The fried fish Night” , (la noche del pescaíto) and the main gate lights and small lanterns are turned on for the first time. The Feria is a small city that takes place one week: it has its own streets (names of famous Toreros or Bullfighters) and every street has hundred of “casetas” where to eat, to dance sevillanas and drink the whole day and night. The best way to finish the day is trying churros con chocolate! It does´t matter how long we try to explain to you what Feria de Abril is. The only way to understand it, is to enjoy it by yourself! We wait for you!! 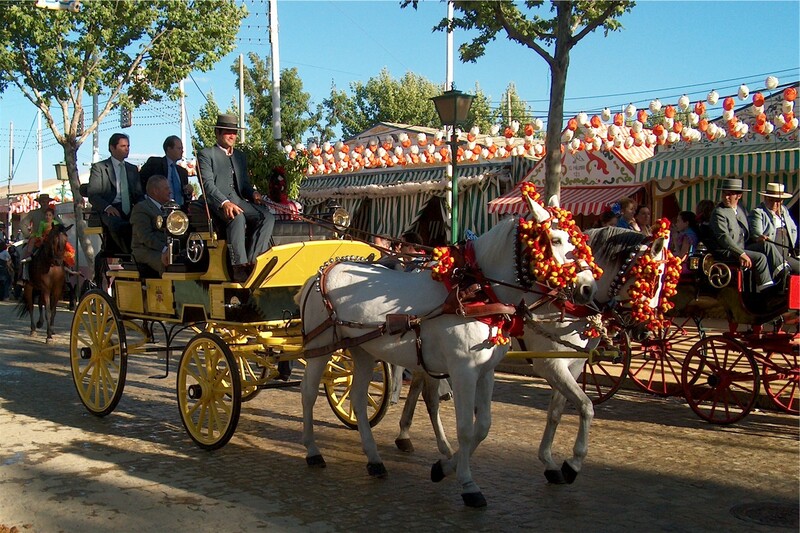 If you are looking for a sevillian guide to show you the Feria with sevillians, just contact us!